Are You Ready To Have The Vacation Of Your Dreams? Choose from the vast selection of Playa del Carmen weekly and monthly rentals. Whether you’re traveling to the Riviera Maya for vacation or contemplating retiring to a Caribbean paradise. There are many styles of accommodations, from the budget minded to luxury beachfront villas with staff. Sit back, relax and let our site help you find exactly what you’re looking for. Take advantage of the new vacation trend of renting your accommodation. What people are starting to realize is that by renting as a family or group there is a tremendous value in terms of cost and quality. Not only is the cost of renting usually the same or less than hotel rooms but there is also a certain level of luxury, privacy, spaciousness, and convenience that’s hard to get in a hotel. Customize your amenities. Do you want something elegant, eco minded, or high tech. With private pool, beach views, or nestled in the jungle. Maybe you’d like to have housekeeping and/or cooking staff, a secluded location or perhaps something central and close to town. Either way you’ll enjoy and create your own cherished memories with friends and family. 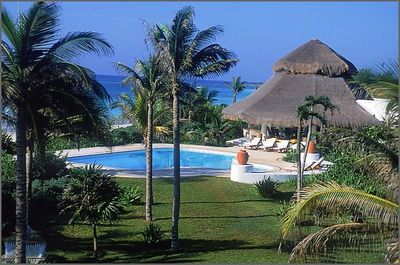 Playa del Carmen weekly and monthly rentals are available for all budgets. Check out our special selection of villas, family vacation homes, apartments and condo rentals in Playa del Carmen.